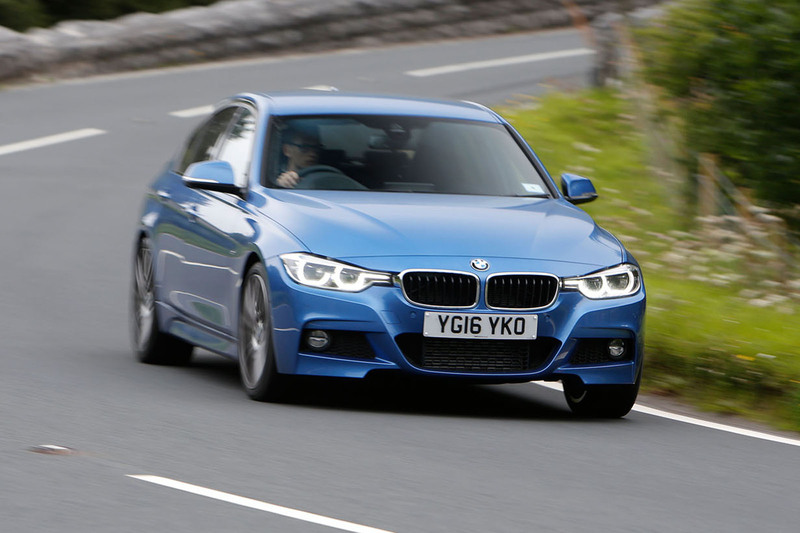 BMW 320d long-term test review: all the car you'd ever need? 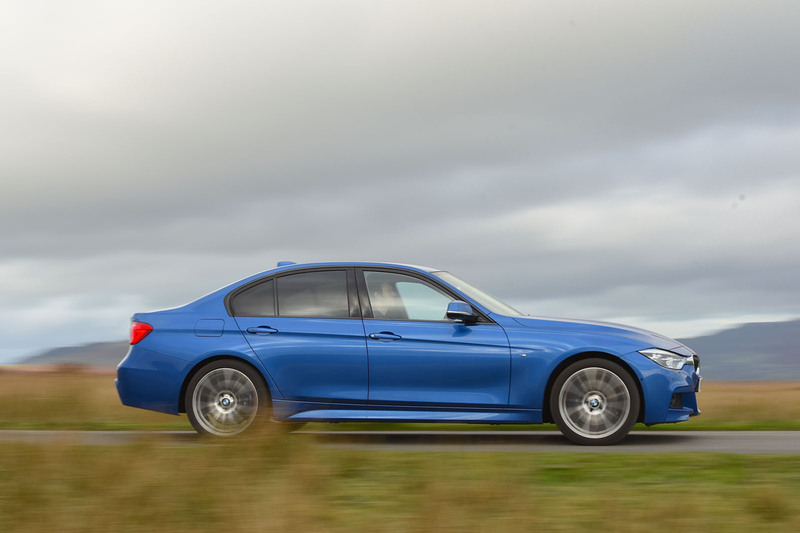 A year and 17,000 miles showed our four-wheel-drive diesel-powered 3 Series in its true colours. So did we like what we saw? 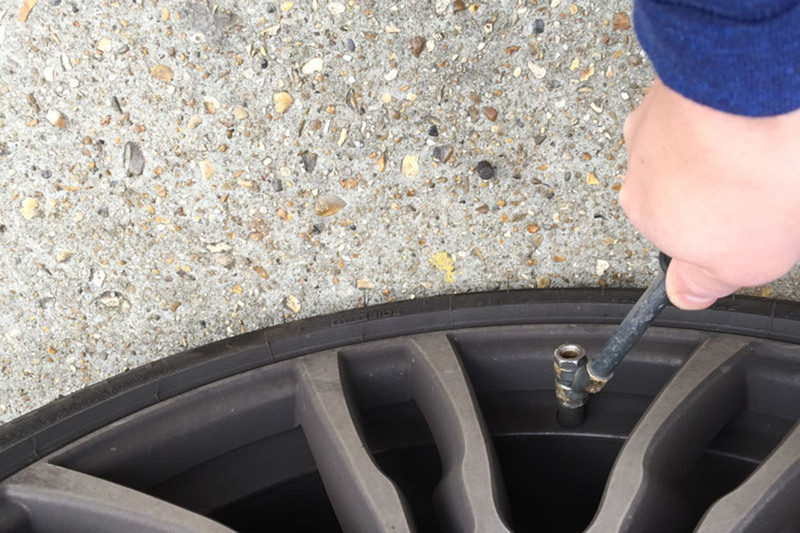 "I’m still haunted by nicking an alloy in the McLaren as I got on the EuroTunnel shuttle en route to Geneva"
An issue with the tyre pressure sensor, perhaps? Ah. But as strange as it sounds, I’m with her on that. Well, I do know why, but I understand what she meant: the 3 Series is one of those cars that gets pretty much every little thing right, in such an unassuming way, that it makes life with it so easy, enjoyable and rewarding almost without you ever really noticing it. Whatever the 3 Series’ status and reputation as a stellar car to drive and a fine all-rounder, though, it still arrived in our possession last summer with a lot to prove. Back then, it had just undergone a facelift and its position as the star pupil of the class it had ruled for so long was under threat like never before. The Jaguar XE had not long been launched and had beaten the 3 Series for handling prowess in comparison tests, even if the plucky upstart did not quite deliver as a faultless exec with which to live when we added one to our long-term test fleet. The Audi A4 had also just come along with its posh interior, and the Mercedes-Benz C-Class was still fresh, with the kind of desirability many rivals envy. However, there was more to this story than determining where the 3 Series ranks among exec saloons, because our car had xDrive all-wheel drive. BMW had long resisted giving UK buyers the option of all-wheel drive, yet it came on this 3 Series (and other non-SUV BMWs) in this generation for the first time. One in five 3 Series saloon buyers in the UK have been specifying their cars that way, but is the £1500 premium worth paying for? Let’s deal with that point first. As you’d expect, you wouldn’t do it for financial reasons. The CO2 emissions of a four-wheel-drive model (123g/km plays 116g/km for a rear-drive version in an equivalent spec) take a hit, as does economy. 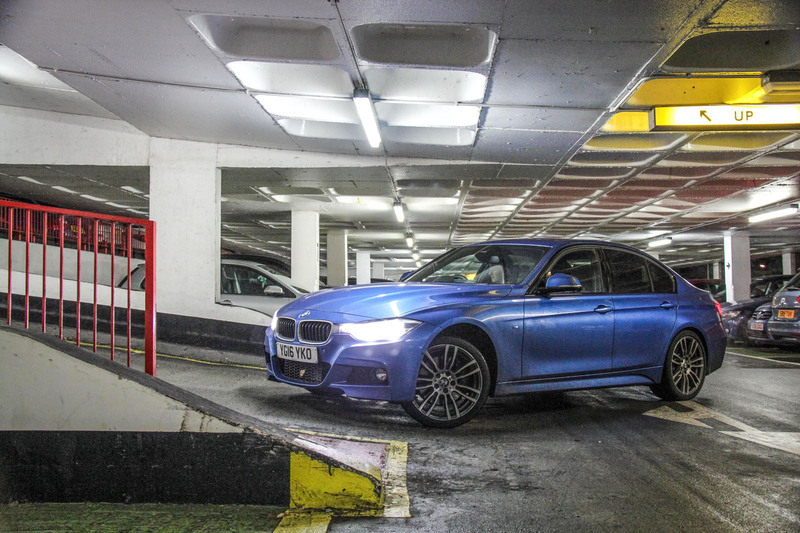 A rear-drive 320d we ran in 2013 returned 61.1mpg over its time with us compared with this car’s 48.1mpg. 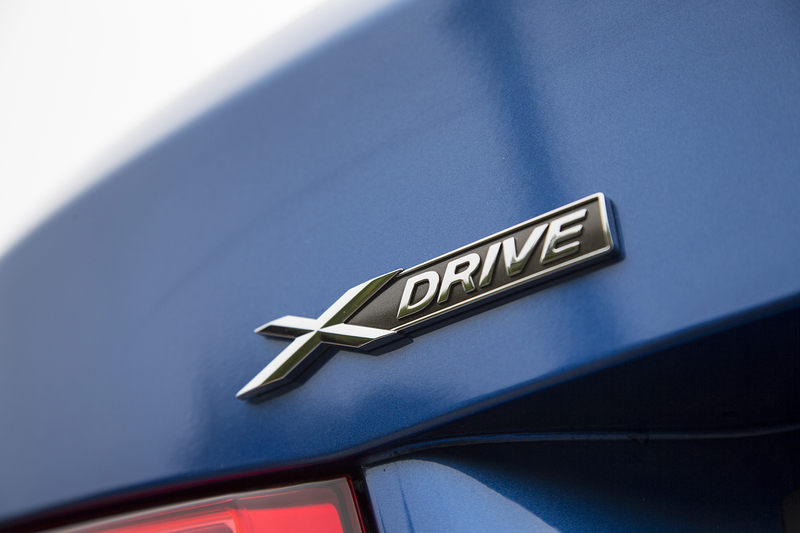 Purists might also have something to say about xDrive itself. Some on the team bemoaned the slight edge being taken off the handling, yet I was impressed by how the nose kept tucked in mid-corner even under plenty of power. But the permanent system with a 60/40 rear-to-front split chiefly added extra rock-solid, surefooted security to the package, and I never properly broke traction, even in the most torrential rain. The system would take a split second or two to work out where to send drive under harder acceleration, yet the little wobble that ensued produced a giggle more than a cold sweat. Sadly, the 3 Series has now gone, but not before an epic drive, halfway across France and back. More on that next time. One smart feature to mention now, though: with automatic wipers activated, the car’s speed limit display automatically updates to the lower 110km/h French motorway speed when it starts to rain, down from the usual 130km/h. Very clever. This generation of the BMW 3 Series brought with it the 4 Series, the new (well, new when it came out in 2014) name for the two-door coupé and convertible versions of the saloon we’ve been running. The 3 Series was facelifted a couple of years ago, but the 4 Series has just caught up with it. Or rather, the 4 Series has gone past it, as I found out from spending a few days in a 440i Convertible. It’s impressive just how far some minor changes inside have lifted what is an ageing architecture. 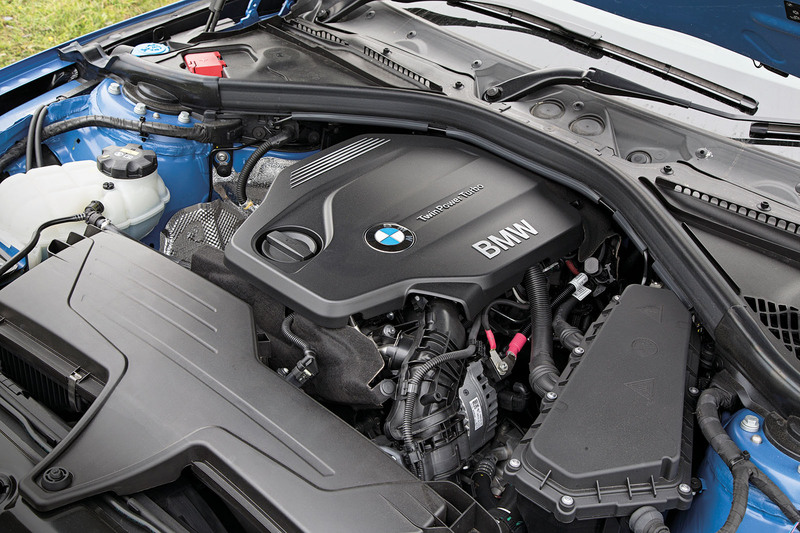 While the 3 Series feels solid, familiar and dependable inside, the 4 Series feels plusher and more interesting visually, despite containing the same core bits. The revisions to the iDrive system, in the rotary controller, the graphics and functionality and also the addition of a wireless Apple CarPlay smartphone integration system all enhance the ‘businessman express’ feel of the coupé. The 3 Series’ interior is tiring and rivals have bettered it in that regard, if not in how it drives. But the 4 Series shows there’s life in the old dog yet. There’s still no better range of compact executive cars overall than BMW’s. It happened as I got into the car after this rather pretty photo was taken of our BMW 3 Series in sleepy Oxfordshire: the formidable ‘dong’ sound that accompanies a warning light coming on. Once again it was the tyre pressure warning sensor, the same warning that had occurred a few weeks earlier, letting me know that the pressure had been dropping in the rear tyre on the driver’s side. Having dismissed it before as the tyre pressure sensor taking a faulty reading, this time I had it checked out at my local high-street garage chain just to be sure. Once the car was up on the ramp, the cause of the slowest of slow punctures was revealed: the offending tyre had a screw stuck in it, and in an area that couldn’t be repaired. All is forgiven, tyre pressure monitoring system: you did your duty. As an added bonus, while I was investigating the reason for the warning in the infotainment system, I discovered a rather cool menu that allows you to see a live readout of the pressure in each tyre. So how much was I quoted for a Bridgestone Potenza 225/40 R19 run-flat? The tyre-fitters quoted some £374, including fitting. Yikes. I thought this was opportunistic high-street chain pricing and said I’d get it sorted elsewhere but, no, other quotes I got from less well-known garages were between £300-400. Online, the quotes ranged between £206-240, including fitting. You can guess where I’ve ordered it from. Despite it staring at me for months in the middle of the 320d’s dashboard, I’ve just noticed a compact disc player. Remember those? It also has a whole row of buttons, numbered one to eight, for pre-sets and to skip tracks on a CD. The 3 Series is great to drive and own, but its interior tech and architecture feels old. A new version arrives next year to address the car’s one major weakness. Even after writing these updates on the 320d for three-quarters of a year, I still wince at the gap between the ‘price’ and ‘price as tested’ figures in the ‘test data’ box on the right. You could drive a Volkswagen Up fitted with a couple of options of its own between them. Are all our 320d’s options worth the money, then? About half of them are. There’s the £2000 M Sport Plus Pack for some extra MSport-ness, including 19in wheels, upgraded brakes, xenon lights and, the killer feature, a Harman Kardon speaker system. I could leave the rest of the pack, especially the 19in wheels and the unwelcome lumpiness they add to the ride, and just take those speakers. The Active Security Pack, at £1100, is another example of a rather jumpy autonomous emergency braking system. It has unnecessarily applied the brakes on a couple of occasions, reducing my trust in it in the process. I’d leave it, as I would the £750 Interior Comfort Pack, which adds some ambient lighting that I’ve hardly noticed. The adaptive M Sport suspension is a must-have, at £515, as is the £1495 Professional Plus media package for the full suite of iDrive function that it adds. BMW’s iDrive is the best infotainment system around in my opinion. There are also a load of ancillary options, each costing a few hundred quid, that haven’t changed my life so, to me, about £35,000 gets you all the 320d xDrive M Sport you’d ever need before you start haggling on the price. A colleague with a contact on the BMW board recently shared a fact he’d heard – that one pound in every four that BMW makes is from the 5 Series. Now I know you’re not reading about a 5 Series here, but given the 3 Series is hardly a rare sight on our roads, the point is that even in a world of SUVs, crossovers, SUV crossovers, crossover SUV- coupes or whatever SUV-shaped niche has been filled that week, the humble saloon remains of immense importance to premium car makers. This tallies with my own experience of life with the 3 Series. I’ve not cast one envious eye towards any kind of crossover since I’ve had the BMW. Maybe it’s just the familiarity of the breed, maybe it’s the quality of the execution from BMW, or maybe it’s just that SUVs aren’t the answer to everything. The 3 Series is not just a very good car, it is a very good saloon car. I like its lower driving position, the way it involves you in the drive, but also allows you to sit back comfortably on longer journeys if you choose.I also prefer the security of a proper boot that hides its contents out of sight, and have yet to be f lummoxed by anything that wouldn’t fit into its opening. The 3 Series suits my lifestyle, and countless others’, too. While exterior looks are of course subjective, for me a saloon wins over an SUV in this area, too. A senior Lexus designer recently told me that saloon cars are the hardest to design, because there are three distinct sections to integrate, rather than just getting the front-end right and flowing back from there. I present exhibit A: the lovely silhouette and proportions of the BMW 3 Series. M Sport steering wheels are as thick as they come, but I like the chunky feel. You don’t get the hand cramps you might get from gripping something smaller too tightly,and I find it nicely sculpted for motorway wafting. I also like the small but solid shift paddles, and the wheel’s multi- function controls are all well placed for intuitive use of the radio. Last year I cashed in an editor’s perk and accompanied/chaperoned/stalked Andrew Frankel on a drive to Geneva in a McLaren 650S. All this served to do, however, was to give me the bug for cross continent thrashes. So I set out to scratch that itch again one blue-skied weekend with a much shorter road trip in the 320d to the town of Amiens in northern France. Granted, it is only 100 miles each way from Calais, but my itch was indeed scratched. Few things are quite as satisfying as a deserted French Autoroute and I made swift progress (okay, perhaps not quite as swift as we did in that McLaren on a German Autobahn...). Road noise from the tyres aside, the 320d made for a wonderful mile-eating companion. The leather seats were supportive, the diesel engine was quiet and frugal (the trip meter indicated 47.6mpg, and the car didn’t even use three quarters of tank of fuel), and the ride was comfortable. There is not much more you could ask for on such a journey. Amiens is a place I’ve driven past a few times, but never stopped to see. The pretty town is in the Somme region and is dominated by a gothic cathedral. It’s also known for antiques shops, so I bought a big chest. It was too big to fit through the opening of the 320d’s boot (perhaps I should have opted for the Touring), but it did fit perfectly across the back seats, which had the added bonus of leaving the boot empty for a pitstop at the ‘booze cruise’ shops on the return trip through Calais. On the subject of crossing the Channel, I’m still haunted by nicking an alloy in the McLaren as I got on the EuroTunnel shuttle en route to Geneva. Think fingernails running down a blackboard, and you’re not far off. I can offer no excuse. There’s less chance of dinging a wheel in the 320d, because a press of the parking sensor button on the centre tunnel switches the view on the infotainment screen to a top-down one of the car. This fine and useful piece of technology helped spare my blushes this time. This picture shows a view I’ve seen twice in the past couple of days. I’ve had to check the offside rear tyre after a recurring tyre pressure warning. Slow puncture? Dodgy valve? Before heading to Kwik Fit, I inflated the tyre to BMW’s suggested higher pressure for carrying heavier loads and the alarm hasn’t come on since. I suspect the fault is in the sensor itself. One of the key things we wanted to find out with this all-wheel-drive 3 Series was how well it could play the role of everyday winter hack. Last month the lightest sprinkling of snow, which turned into a ‘get the de-icer out’ cold snap, allowed us to put it to the test. The best way to describe the car is sure-footed; BMW has subtly altered the 3 Series formula to take the edge off the handling in favour of a more rounded package. With a smooth, torquey diesel, an automatic gearbox, all-wheel drive, leather seats and a thick-rimmed steering wheel, BMW has created a near-peerless all-round cruiser that’s hard to fault as an everyday proposition – even if the top level of dynamic sparkle is lacking. Reader Gavin Hall, a serial 3 Series owner who is currently driving a 320d xDrive Touring, contacted me to describe his car as “safe, efficient and reliable”, but admitted he wouldn’t get out of bed on a Sunday morning just to drive it for pleasure. He’s right: this isn’t the 3 Series for a Sunday driver, rather one you’re happy to use from Monday to Friday, once the de-icer has done its work. A flaw in the xDrive’s otherwise impressive everyday usability: the turning circle is dire. And it’s something I have to deal with three times a day: twice negotiating our oh-so-tight multi-storey car park in Twickenham and the other at the end of the cul-de-sac I live down. It’s not just me, either. Reader and 320d xDrive driver Gavin Hall has got in touch with the same observation. The BMW i8 I usually report on in this space has been temporarily snaffled by my office-based colleagues, as well it should be: when something that brave, innovative and different comes to stay, it’s important that as many of us as possible have the chance to understand what it can and can’t do. 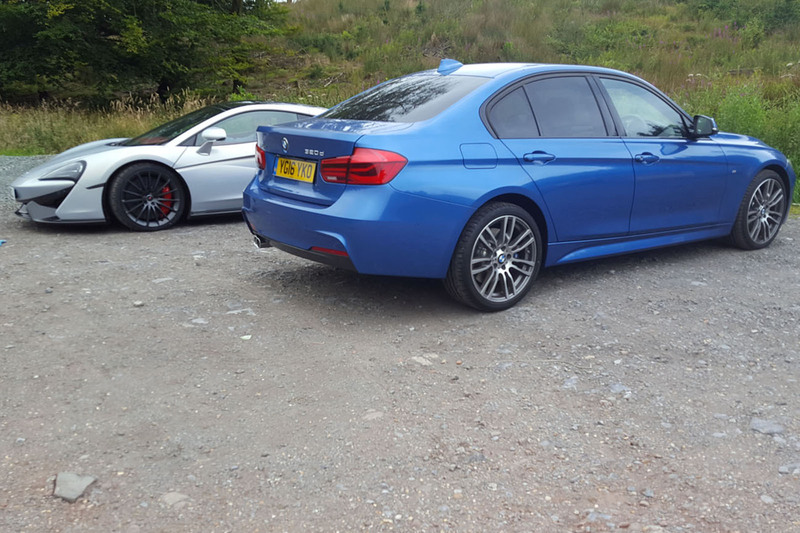 Which means the 320d of deputy ed Mark Tisshaw has been holidaying at my place in the Welsh borders these past few weeks. I am a huge fan of the oil-burning 3 Series and have been since the mid-1990s, when a 325tds was first to prove that the words ‘fun’ and ‘diesel’ no longer need sit as strangers in the same sentence. And for the breadth of their performance and fuel consumption envelopes, successive generations of 320d have been the best of the lot. Even now, I’d say the 320d remains the most capable real-world small saloon out there. But not once in all those years have I thought one might be improved still further by the fitment of four-wheel drive. And after a few weeks in this xDrive-equipped 320d, I still don’t. Maybe I’d be grateful for it come the winter, but less so than I’d be for a set of tyres appropriate to the conditions. Indeed, the most obvious day-today effects of the four-wheel drive system are that it uses 10% more fuel and nudges it into a higher tax band. I’ve never bought in to four-wheel drive as a safety system, because while cars so equipped are far better at gaining speed in poor conditions, they are no better at all at losing it. Just out of professional curiosity, I did throw it through some tight turns and was impressed by the way it kept its nose into the apex under power, but that hardly justifies the additional outlay and running costs. So although I continue to live in a slight state of awe at just what a package the common or garden 320d continues to represent, it would be the cheaper, lighter, more frugal and tax-efficient standard rear-wheeldrive car I’d choose every time. Very useful if you tow across fields from time to time or live in more remote parts of Britain throughout winter. Day to day usage in summer less useful. Useful if like us, you live in country like the UK but regularly travel to places where all wheel drive is really useful, if not an absolute necessity. We've always had at least one of our cars equipped with all wheel drive. Even when we travel to the French Alps in the middle of summer you can sometimes find snow (and a lot of it) on the high peaks. In the winter it's usually metres deep. Munich is close to the Alps. There are plenty of rich, BMW-buying areas where AWD is expected due to frequent snow. I agree that AWD isn't universally useful and that good winter tyres offer a better support, however in many of these key markets winter tyres will already by either a legal requirement or widely used. Winter tyres + AWD is what these markets demand. What might surprise you is how good EVs are in the snow. My i3 (on winters) isn't that far off the Forester (on winters) unless the snow is so deep it starts to build up under the front. We'll be interested in how the i8 is in the snow. ...will know that 4WD is the difference between getting home and putting your feet up, or getting out the car, removing the spade from the boot, chipping away around the rear wheels and hoping somebody with thick gloves on and a good back will give you a push. I tend to agree with the sentiment of the Writer re RWD, but would the negative aspect have been included in the Article Headline if the Car had been a Quattro? What does this mean ..
" Price £32,910 Price as tested £42,270 .."